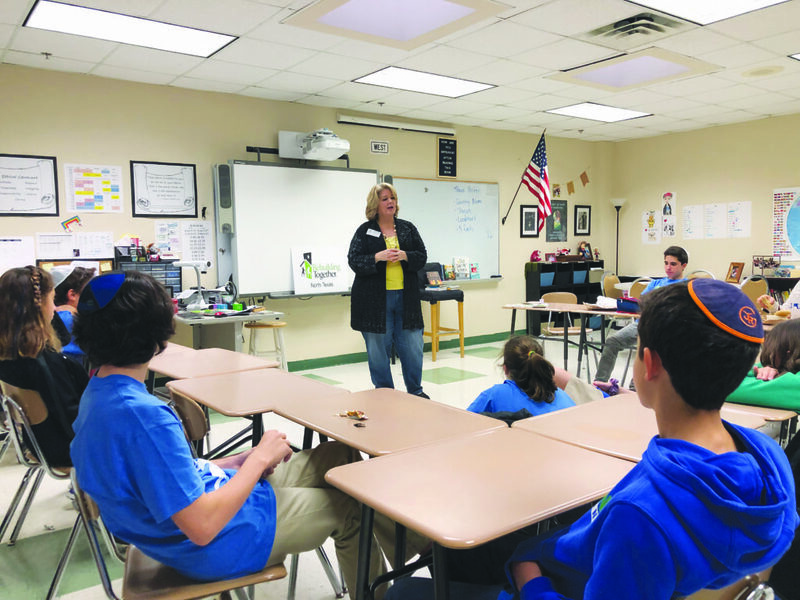 Cara Mendelsohn spoke to Levine Academy eighth-graders about the important work of Rebuilding Together, where she serves as executive director. Cara Mendelsohn seems like an obvious candidate for Dallas City Council’s District 12, which includes Far North Dallas and parts of Collin County, in the upcoming May 4 city elections. The list of leadership positions she’s held could fill a novel. But she never thought she would be running for political office; she’s just a believer in tikkun olam, helping the local community she’s so passionate about. Mendelsohn’s work tells the stories of her passions. She was the vice chair of the City of Dallas’ Citizen Homelessness Commission and also serves on two of the city’s housing policy task force committees. She has also served on the city’s bond taskforce subcommittee on homelessness and economic development, and the mayor’s task force on homelessness. She says she became involved in the homeless community while serving as the Plano ISD’s PTA council president. Mendelsohn grew the coalition from 10-15 people to a couple of hundred and led the first homeless count. She shined a light on a part of the community that people didn’t see. This led to her becoming the director of marketing and advocacy for The Samaritan Inn in Collin County. In other professional roles, she was director of community engagement with VNA and is currently executive director Rebuilding Together North Texas, which provides free home repair to low-income seniors, veterans and people with disabilities. Through the lens of the vulnerable populations, Mendelsohn started to see bigger problems. Another part of Mendelsohn’s platform is helping foster a stronger police force through competitive pay. Delayed response times are symptomatic of an understaffed department. She notes that six and seven years ago, the city of Dallas had over 3,600 officers. Now, despite the population increase, there are less than 3,000. Mendelsohn also wants to open the doors to digital communication between the local government and the people of District 12. She plans to increase Facebook communication to update Dallas residents on what the local government is doing, and also use it as a way to give people a place to voice their concerns. It’s a need she finds especially important for District 12, which is the farthest from City Hall compared to other districts. There’s no other place Mendelsohn hopes to serve in public office. She has a passion for the community and its needs, and is running only because she believes she can be the person to take on the challenge. Campaigning is the worst part, she said. Even though she doesn’t mention it herself, she has received many awards, including the Collin County Volunteer of the Year, The Plano ISD Community Impact Award and at least six others. She has helped several people with their campaigns, including Michael Friedman for Plano ISD school board. Friedman ran for Plano ISD school board trustee with Mendelsohn as his campaign manager. He believes that her kind heart and level of intelligence allows her to communicate effectively with a wide variety of people. She’s well-researched, looking at all sides of every issue to make well-informed decisions, even when they’re tough. And as a leader in both the Jewish community and city of Dallas, Mendelsohn will face many of those. But if elected, she’ll be following in the footsteps of many prominent Jewish women in Dallas like former mayors Annette Strauss, Laura Miller and Adlene Harrison. Learn more about Cara Mendelsohn’s campaign at http://caramendelsohn.com/.